Straight out of back-to-back Ratha Yatras, we journeyed by Gautrain and a two-hour flight, and then arrived in Cape Town. But it was really nice to see everybody again on the first evening and we had a good time at the temple program. I think South Africa is a country full of variety – there are so many programs that are of a totally different nature. 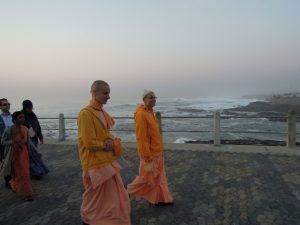 Cape Town has very nice university programs (University of Cape Town & Stellenbosch University) and we visited houses in Tableview, Bellville and Somerset West to meet devotees. This was nice because each home has its own atmosphere and brings out a different mood. So taking the trouble to go to all these different places makes a lot of sense because it’s part of entering into relationships with people. In the past I did so many projects – big building, properties, etc. but now my life centres around relationships with people. That’s very satisfying because Krsna is in the centre therefore it makes these relationships worthwhile. We had an initiation ceremony during the Sunday feast and we really took time to prepare the devotees in their spiritual journey. I gave the example where I (as the spiritual master) put people on a little transcendental boat on the bhava sagar (the ocean of material existence) and the boat is still at the shore and everything is fine, and then suddenly we give that boat a push and suddenly that initiated devotee is out there! Then one has to make a conscious effort to make spiritual life more meaningful by doing deeper spiritual activities. In this way, the vows of initiation begin to flourish. The whole ceremony made people think as many devotees came with questions afterwards. Following the initiation ceremony, the programs continued and once again we spent a night in Pringle Bay. It’s quite a place – a tip of the bay where long waves are coming in from the ocean and splashing against the rocks. There are baboons and night-adders, we were told. A real mode of goodness exists in that place actually. We were invited by Mukunda and Mira, who live there with their two children. In the back of their house, Mira started her own mini-school with a little classroom. She is a qualified teacher and teaches her own children as well as some others from the neighbourhood. Remuna, who was initiated at the yajna on Sunday (previously Remina), lives there with her children too. Bhakta Steve, who is studying jazz piano at the University of Cape Town, came along. A lot of energy went into preparing breakfast and it was absolutely great – everyone was satisfied. 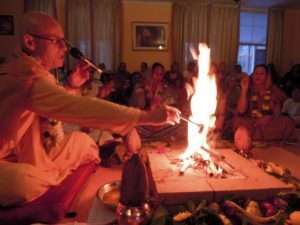 And then Mukunda brought up the ‘hot potato topic’ of brahmacary ashrama: Should brahmacarys be trained to become grhastas or should they be trained to become sannyasis? I said that in the beginning it should be open-ended and then later the brahmacarys can make a choice as to which direction they want to go. Because if people think, I’m going to be brahmacary for two years, then how can they really be serious about it… Still, it may be that a large percentage will get married in the future. Then we spoke about how most brahmacarys are putting too much emphasis in cultivation but not enough on conviction which can actually lead to fanaticism. When the conviction is strong, in other words when one thoroughly understands that this life is for going back to Godhead, then why get distracted by anything else? Therefore one doesn’t need so much cultivation to remain strong in the ashrama and one doesn’t need to be so harsh in dealing with women. But if the conviction is weak and one is thinking: Well, I guess I don’t really want to be married so I guess I just stay a brahmacary. Then one is not strong despite all the cultivation of a brahmacary mood and one will still feel week. Anyway that gave the boys some food for thought over breakfast! Then we rushed out the door for the Stellenbosch student program at a beautiful university, in a beautiful area, for beautiful people. And actually there is nice group of students there so we had a good time again. Now we are driving back to the Cape Town temple, the late lunch is waiting and I’m starving. Tomorrow is the big big flight: Cape Town –> Johannesburg –> Perth –> Sydney and then a drive to Wollongong Australia, to be part of a retreat at Govinda Valley. It looks like it’s going to be good!